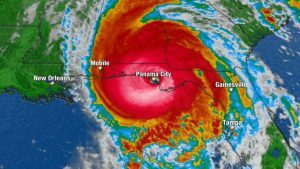 PANAMA CITY, Fla. (NBC News) – Hurricane Michael has slammed into the Florida coast as a powerful Category 4 storm, packing sustained winds of 155 miles per hour. It’s the most powerful storm on record to hit Florida’s panhandle. The eye of the hurricane made landfall around 1:30 p.m. near Mexico Beach, 20 miles southeast of Panama City. Along with the intense winds and heavy rain, Michael was expected to bring a deadly storm surge of up to 14 feet along the coast. By 4 p.m. the storm still packed sustained winds of nearly 140 miles per hour as it moved further inland towards Interstate 10.